Which Legal Entity Is Right For YOU: Sole Proprietorship, Limited Liability Company or Corporation - iSmallBusiness.com - Small Business Stuff That Matters...Pass It On! When you’re starting out as a small business you’ll have many important decisions to make, one of the most important of which to begin will be the type of legal entity you want to form to do business. There are pros and cons to the various forms available in the U.S. and they vary greatly by your state’s requirements and regulations, so you’ll want to do some research for your specific location. However, here are the basic guidelines of each to help you form your initial decision about which form is right for you. The sole proprietorship is the most basic of business forms. That’s because technically it isn’t even a business form or entity. A sole proprietorship is simple you coming up with a Trade Name that you invoice and advertise under, but from which you have no real separation. It means that it’s easy to set-up, requiring only that you register you and your sole proprietorship trade name with the appropriate local city and state licensing bureaus and voila! You’re in business. When tax time comes, all your accounts payable will have come in under your name and trade name and will all be tied to your personal social security number. This can make the sole proprietorship easy and very cost affordable to start a business. However, with that ease to entry comes some factors to consider. While you don’t have the upfront cost of filing corporate legal documents with the state, filing for an EIN (employee identification number, covered in the next section) or opening a separate business banking account, it does make you totally accountable for the debt, liability and yes, lawsuits or fallout, that may come from operating a business. While there are no upfront costs to this form of business, there are also no real legal protections that buffer you from your business in any way. So why have a sole proprietorship at all? It’s still a very good business option for certain types of professionals getting started with their small business and you can graduate from this to a legal entity as your business grows. You won’t have to worry about voting or annual meetings and notes and you can co-mingle your business and personal funds, which you can’t do with a business. Even as a sole proprietor, you’ll need to get the proper city and state business operating licenses (this is for taxes). A simple Google search should help you find what those local licensing bureaus are so you can be sure to be compliant. Fines and fees for skipping this can be steep, so make sure to check and pay the nominal up-front costs to be properly licensed. Also, at year’s end you’ll still need to file your standard Schedule C tax forms and your standard 1040 tax form, but you’ll also need to pay taxes claiming your sole proprietor status with an IRS Form Schedule SE to handle any necessary unemployment taxes. While you won’t owe any unemployment taxes for yourself, you will owe them for any employees you hire on, even as a sole proprietor. There’s no getting around Uncle Sam. Additionally, as a self-employed sole proprietor, you’re no longer eligible for unemployment benefits if times get rough; so bear that in mind for your planning and saving. A limited liability company, called an LLC for short, combines the best aspects of a business entity’s legal protection with a partnership agreement’s pass through income. While they aren’t allowed in every state, in those states that do allow them the LLC is a very popular form of business entity for it’s reasonably simple and easy to set-up structure and reporting requirements. Basically the partners coming together to form a limited liability company have a layer of protection from it’s legal status to protect themselves from liability (think lawsuits, debt, et al) while still enjoying a simple structure that isn’t too cumbersome to run and allows the LLCs profits to pass through and be claimed against each member’s personal income at year’s end. The caveat to the limited protection is members are only liable for the debt that they secured themselves and put into the company, for example if a member of the LLC decided to secure equipment on a personal credit card on behalf of the company, they are now liable for the debt on that credit card. So why have a limited liability company at all? The LLC provides some very favorable business benefits to its members. For starters, which it can’t protect you from debt secured personally, it can provide protection from debt secured by the company itself. It also forms a legal entity barrier of protection against lawsuits, so you personally aren’t held liable for, say an accident on your LLCs property. It also allows for the year-end profits to be divvied up between partners and passed through to each member. For this reason many property holdings and real estate investors form LLCs as they protect them personally from lawsuits while allowing them the annual (or quarterly) pass-through income from their property. LLCs can be single-individual owned, in which case no separate IRS form filing is required beyond a Schedule C and claiming on your Form 1040. For a multi-individual LLC the same procedure is followed, but each member will also need to complete a Form 1065 (A Partnership Agreement Tax Form, even though the LLC is technically not a Partnership it’s still required by the IRS). You’ll want to talk with your CPA more about the differences and forms at tax time. LLCs are also able to issue many different classes of stock with different rights (which corporations and sole proprietorships can’t do) and are able to have unlimited members, all of which can be individuals, other corporations or even partnerships. LLCs can also offer tax benefits in addition to legal protection. When that year-end profit is passed through to members, it’s considered active income as each member of the LLC is considered an active member. There is protection against the legal ramifications of being an active member, while capitalizing on the tax deduction benefits of being an active member. This isn’t the case for other legal agreements, like for instance the Limited Partnership Agreement, which says active members may use their active income against their personal income, but have no legal protection from liability, where if they’re passive members they in turn can’t use the loss from their partnership to write off against their own personal income. For that reason alone a LLC makes for a great option to members. If an LLC is so great, why bother with any other form of business? Well for a few reasons because like all entities there are things beyond just the pass through income benefits and liability to consider. First, not all states allow limited liability companies. You’ll want to check with your local state to see if this business structure is even a possibility for you. Secondly, all LLC members are considered self-employed and must pay self-employment tax on themselves. Third, you’ll need to file an Operating Agreement and Articles of Incorporation with the state in which you file your LLC, get an EIN (Employer Identification Number - used like a social security number for your business on all tax and legal paperwork and required for setting up banking accounts) and have a CPA prepare your annual tax returns to ensure all members of the LLC are receiving their proper LLC 1099 disclosure forms. Finally, and perhaps the biggest issue, in order to participate in an LLC each member must adhere to strict transfer restriction requirements. This means that transferring your ownership shares is highly restrictive and not easy, or quick to do. For a large corporation that makes it’s money and raises capital by quickly transferring and selling shares, this is clearly not a reasonable business structure. In order to get investors and capital, large corporations need shares that are easy to trade and transfer in stock exchanges. There are two types of corporations: C corporations and S corporations. What’s the main difference? It’s primarily in the tax structure. C corporations are essentially taxed twice (the corporations net income is taxed and then profits passed through to shareholders are taxable), while S corporations carry all profit and losses over to their individual returns and are only taxed on that income. While they’re taxed differently, both C corps and S corps provide a barrier of legal protection by their business entity structure. So why have a C Corp or S Corp at all? If you get double taxed in a C corporation, why would anyone even want one? Well, while the structure of an S corporation it favorable to small businesses, there are actually several benefits to the C corporation structure for large businesses. To start, an S corporation is limited to no more than seventy-five members, and just “who” those entities are is restricted (including the requirement that they be U.S. citizens or U.S. companies). S corporations only allow for one form of stock issuance whereas C corporations (and LLCs) can offer multiple stock classes. C corporations are also not limited by how many members can hold stock in its corporation and they aren’t required to be U.S. citizens. Okay, well then why have an S Corp and not an LLC? 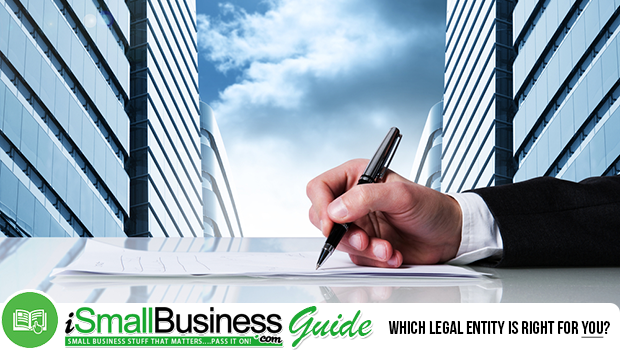 For a small business, the S Corp and LLC are probably the two most common business entities. You’re read all about the LLCs but what is different about the S Corp? To start, you can be a sole owner S corporation. Issue all your companies shares to one person, yourself, and list yourself as the primary and sole partner and you’re fine. With an LLC you’d need at least two members to get started, so bear that in mind. An additional benefit of the S corporation over an LLC is that shareholders in an S corporation can sell their stock at their own digression, whereas there are restrictions to transferring shares of an LLC that require the approval of all members. Another feature of the S Corp is it allows for many more allowable tax deductions, and more unusual ones than an LLC. You’ll want to consult with an attorney to determine which ones you qualify for with your S Corp but often they include things like education expense write-off allowances as well as allowances for travel to annual corporate meetings. Because as an S Corp (or a C Corp) you’ll need to keep minutes and hold an annual corporate meeting as part of the legal requirements to file with the state. There are many other factors to consider like taxable wages, corporate issued W2’s and more. You’ll want to consult an attorney and a licensed CPA to investigate what all the benefits are in your state and which is right for your situation. More C Corp & S Corp resources…. **Editors Note: The information in this article is meant to be informative, but not definitive. This is the expressed opinion of the author(s). You should consult a licensed attorney and certified public accountant in your local area when forming any business entity or making a business entity filing decisions.